I am not a big fan of the poetry of John Keats (my professor says “of course, noone likes Keats” but that might be an overstatement) but his lifestory is so beautiful and sad and romantic that I wanted to share it here. John Keats was an English poet who lived from 1795 to 1821, he died at 26 leaving an impressive amount of high-quality poetry. Before he was 15, his mother, father, and grandfather had died. When his grandmother died, he was entrusted with the care of his brother Tom, who suffered from tuberculosis, the same illness that had killed his mother. Keats left for a journey through Scotland and Ireland, but the physical exhaustion and bad, wet weather proved to be bad for his health. He had to return early, suffering from a sore throath, and what were probably the first signs of tuberculosis. When he returned, he found his brother Tom’s condition had deteriorated, and he died in 1818. Keats moved house and fell in love with his neighbor’s daughter, the eighteen-year old Fanny Brawne. It was a very unhappy affair: while the couple did get engaged, they knew they would probably never marry because Keats was very poor (the little money he made he send to his other brother in America, who was almost bankrupt due to an unwise investment) and his health was quickly worsening. In 1820 he was invited to spend some time in Italy by Percy Bysshe Shelley, but he writes back that he might not be able to visit, because he thinks he might die before that time. Finally he did move to Italy, where he died in 1821. 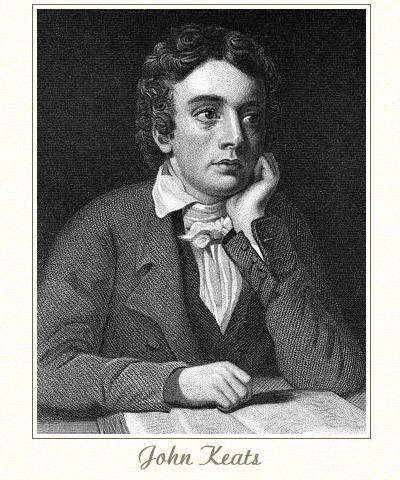 Keats was a very sensitive person, and it is said that his health was influenced by bad reviews on his poetry, which were above all motivated by politics, not by the poetry’s quality. Shelley called Keats “a pale flower” and Byron, who disliked him, said he was “snuffed out by an article.” Keats’ death later inspired Shelley to write the poem Adonais, and when Shelley’s drowned body was found (a year after Keats’ death) it had an open book of Keats’ works upon it. Keats’ letter to Shelley can be read here. Ah… the British Romantics are so tragically beautiful… Lord Byron, Shelley… and the pre-Romantic Thomas Chatterton. The list goes on. Thanks for this. I never really remembered much about Keats. I don’t know why people don’t like Keats. I find his poem The Eve of St. Agnes one of the most beautiful poems ever written. I can’t believe people don’t like Keats!! I think his language and imagery are exquisite! Everyone should drop what they are doing and rush to read read “The Eve of St Agnes” (Thank you Marija, you are totally right!) Also “Sleep and Poetry”, “Ode on Melancholy”, and “To Autumn”. In terms of art, the Pre-Raphs painted some exquisite versions of his poems as well: for example J.W. Waterhouse did two for “Lamia” and one for “La Belle Dame Sans Merci” and Millais’s “Eve of St Agnes” is so lovely.) Thank you for spreading the word about Keats: his last letter before he died makes me tear up every time I read it! I’m surprised your professor says no one likes Keats. I love Keats, and have liked his poetry since high school. You simply can’t beat the sheer sensuousness in Eve of St Agnes, and the rich, vivid imagery in Lamia. Even his lesser work, Isabella or the Pot of Basil, is filled with feeling and passion. It’s actually ironic our perception of a poetic personality is really derived from the Romantics, rather than the Metaphysical or Victorian poets. Life was like this in this period,,,,,for sooo many…hard brutal and short. We are so fortunate to live and love right now. Thank you for posting this in remembrance of the lyricism that died when Keats did. pS Byron was a jerk!